Vemcon Technology platform - Vemcon GmbH | Maschinensteuerung neu gedacht. No matter if it is a tailor-made joystick or operator assistance, clients can rely on the fact that our systems and products are built using an extensive, modular technology platform. This platform is manufacturer independent and meets all compatibility requirements for retrofitting. The client receives a solution which is highly suitable to the machine’s processes resulting in a noticeable increase in productivity. Furthermore: At any time the platform can be easily upgraded with additional features. This way the machine will continue to play a key role for the client – today and in the future. The hard- and software platform’s integration is effortless. Clients have the possibility to combine or expand systems, products and components of their choice. In this way varying requirements can be fulfilled without any additional development. The components are compatible to a range of existing interfaces. Depending on the degree of desired assistance/automation and existing hardware, the client can opt for a complete system or individual components. If desired, the terminal can also be integrated without a display. 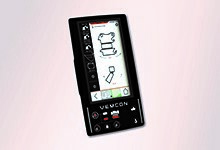 The ToolTracker is an intelligent component of the Vemcon tool manage-ment. The sensor measures vibrations and positions at the tool in order to communicate the data into the cloud or a terminal in the machine. The ToolTracker has a particularly robust housing, is energy-saving and durable. The highly dynamic IMU sensors are used for the precise deter-mination of the current angle and current angular velocity during dynamic movements. For example, they provide information on how and at what angle the excavator arm and bucket are positioned. 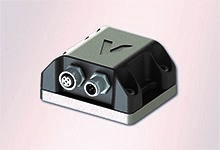 IMU sensors have a compact and robust design and are quick and easy to calibrate and parameterize. 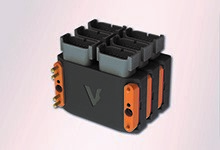 The input and output modules are compact, robust, stackable modules for distributed control systems. 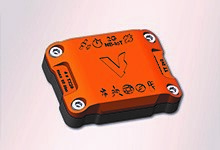 One function bundle of up to 8 functions can be controlled per module. The possibility of stacking the functionally safely developed modules or integrating them decentrally into the machine creates flexibility in purchasing and installation as well as cost savings. Individual modules can also be retrofitted as required.